Gayle and Sharlene talk about what they are wearing, what they are stalking, and of course, what they are knitting. Grab your knitting needles, your favorite yarn - or your favorite craft - and come knit with us! We are on Ravelry as gayleywayley and knitterninjashar. The Yarniacs Episode 190: To Swatch or Not to Swatch? The Yarniacs Episode 189: The One Where Nani Speaks! The Yarniacs Episode 188: Stalking Skirts! The Yarniacs Episode 187: I Spy Colorwork! The Yarniacs Episode 186: Stalking Stitches Past! The Yarniacs Episode 185: Stalking the Queue! The Yarniacs Episode 184: Happy 7th Anniversary to Us! The Yarniacs Episode 183: Knitting in the New Year -- 2019! The Yarniacs Episode 182: New Knitting Traditions! The Yarniacs Episode 181: Knitting for Paws and Charity! The Yarniacs Episode 180: Holiday Gift Knitting! The Yarniacs Episode 179: Repurposing Stalking! The Yarniacs Episode 178: Knitting Colorwork! The Yarniacs Episode 177: Knitting on Caltrain! The Yarniacs Episode 176: Colors of Fall 2018 KAL Wrap-Up! The Yarniacs Episode 175: Knitting Through the Changing Seasons! The Yarniacs Episode 174: The Episode That Almost Wasn't! The Yarniacs Episode 173: Winding Yarn! The Yarniacs Episode 172: Colors of Fall KAL Update! The Yarniacs Episode 171: Knitting for The Baby! The Yarniacs Episode 170: Knitting Tech Tips! The Yarniacs Episode 169: Knitting Pattern Fatigue! The Yarniacs Episode 167: Knitting the Colors of Fall 2018! The Yarniacs Episode 168: Here Come the Summer Knits! The Yarniacs Episode 166: Knitting Soothes the Troubled Spirit! The Yarniacs Episode 165: #yarniacssweaterchallenge! The Yarniacs Episode 164: Post-NoCKRs Joy! The Yarniacs Episode 163: Self-Indulgent KAL 2018 Wrap Up! The Yarniacs Episode 162: Knitting with Nani! The Yarniacs Episode 161: Stitches West! The Yarniacs Episode 160: A Knitting Triumph! The Yarniacs Episode 158: Happy 6th Anniversary! The Yarniacs Episode 157: Knitting in the New Year! The Yarniacs Episode 156: Knitting with Robbie! The Yarniacs Episode 155: Knitting with Harbor Seals! The Yarniacs Episode 154: Yarn in the Trunk! The Yarniacs Episode 153: Return of Sweater Weather! The Yarniacs Episode 152: Knits and Yarn Labels! The Yarniacs Episode 151: Yarn on the Train! The Yarniacs Episode 150: Colors of Fall KAL 2017 Wrap Up! The Yarniacs Episode 149: Knitting in Fashion! The Yarniacs Episode 148: Stalked by Squirrels! The Yarniacs Episode 147: Summertime and the Knitting's Easy! The Yarniacs Episode 146: Knitting with the Squirrels! The Yarniacs Episode 145: Knitting Friends! The Yarniacs Episode 144: Knitting with Andrea! The Yarniacs Episode 143: Knitting with Helen! The Yarniacs Episode 142: Stalking All the Shawls! The Yarniacs Episode 141: Stash Anxiety! The Yarniacs Episode 140: Knitting Up 2014 Part 2! The Yarniacs Episode 139: Knitting Up 2014! The Yarniacs Episode 138: Knitting Post-NoCKRs! The Yarniacs Episode 137: Self-Indulgent Knitting Wrap-Up! The Yarniacs Episode 136: Vacation Knitting! The Yarniacs Episode 135: Knitting After Stitches! The Yarniacs Episode 134: Knitting Interpretations! The Yarniacs Episode 133: Love Your Stash! The Yarniacs Episode 132: We Forgot Our Own Anniversary! The Yarniacs Episode 131: Knitting in the New Year! The Yarniacs Episode 130: The Episode that Almost Wasn't! The Yarniacs Episode 129: Still Knitting Hats! The Yarniacs Episode 128: Something a Little Different! The Yarniacs Episode 127: Knitting as Usual! The Yarniacs Episode 126: Finishing Your Knitting! The Yarniacs Episode 125: Default Knitting! The Yarniacs Episode 124: Knitting the Colors of Fall! The Yarniacs Episode 123: Knitting Oddities! The Yarniacs Episode 122: Knitting to the Last Light of Summer! The Yarniacs Episode 121: Knitting All the Donners! The Yarniacs Episode 114: Knitting All Around! The Yarniacs Episode 113: Knitting at NoCKRs! The Yarniacs Episode 112: Knitting Hidden Gems! The Yarniacs Episode 111: Knitting at the Beach! The Yarniacs Episode 110: Knitting Interpretations! The Yarniacs Episode 109: Reading Knitlandia! 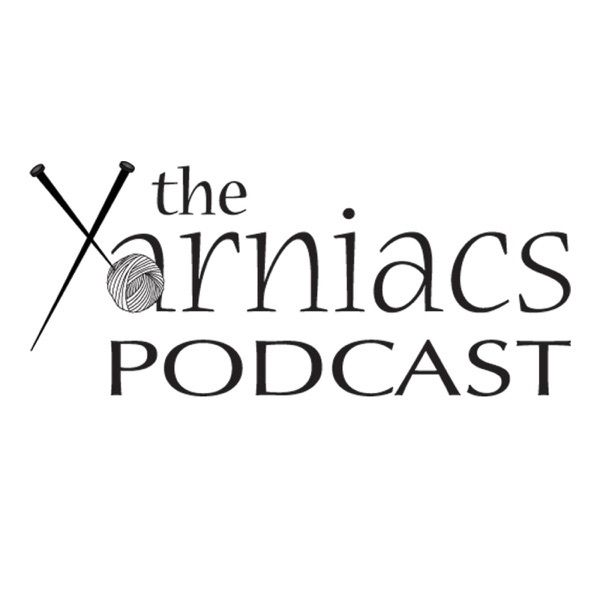 The Yarniacs Episode 108: Knitting at Stitches West! The Yarniacs Episode 107: Knitting on the Mend! The Yarniacs Episode 106: Four Years of Knitting! The Yarniacs Episode 105: Welcome 2016! It's Episode 80, our 3rd Podcast Anniversary! In Episode 79, we chat about knit-alongs! In Episode 78, we keep it short and sweet! In Episode 77, we chatter away and manage to fill an hour with just our regular segments! In Episode 76, we we have lots of giveaways and coupon codes, in addition to reviewing "Curls" by Hunter Hammersen! In Episode 75, we talk about "what to do when you hit a snag"! In Episode 74, we talk about quick-ish gift projects! In Episode 73, we interview the delightful Edie Eckman!! In Episode 72, we launch the new logo! In Episode 71, we share The Big News! In Episode 70, we share some knitting fails! In Episode 69, we chat about crochet! In Episode 68, we chat about the Colors of Fall KAL! In Episode 67, we are swatching with plant fibers! In Episode 66, we are back to basics with two reviews: Knits that Breathe and Mystic Shawls! In Episode 65, we are thrilled to welcome Joji Locatelli! In Episode 65, it's all about the Colors of Fall KAL! In Episode 63, we record on West Cliff Drive in Santa Cruz! In Episode 62, we kick off our Designer Series with Wendy Bernard of Knit and Tonic! In Episode 61, we discuss even more inspirations. What are your fiber and pattern inspirations? In Episode 60, we discuss inspirations. What are yours? In Episode 59, we are swatching the new Dream in Color base - Jilly. In Episode 58, we ask "What's in your notions bag?" In Episode 57, we Stalk All The Things from Stitches West 2014! In Episode 56, we talk about all things knitting at Seabright beach! In Episode 55, we have the honor of interviewing Jeanne Carver of Imperial Stock Ranch and Imperial Yarns, who provided the yarn used to make the US Olympic Team's Opening Ceremony sweaters! In Episode 54, it's all about the buttons! In Episode 53, we kick off New Year Knitting with the Self-Indulgent KAL! In Episode 52, we interview Brooke Sinnes from Sincere Sheep! In Episode 51, we are the queens of small projects. In Episode 50, we enjoy a pre-Thanksgiving day of relaxation! In Episode 49, it's a review-apalooza! In Episode 48, we happily chatter away with our normal segments and some reviews! In Episode 47, we interview the Knitting Rock Star Clara Parkes! In Episode 46, we are back to our usual segments! Interview with Clara Parkes next episode, as we continue the Wool Series. In Episode 45, we continue our Wool Series with an interview with Deb Robson. In Episode 44, we see dolphins and kick off our Wool Series.